The clouds were gloomy and it rained the last few days . Well, for me , I welcomed the rain for it was terribly hot and humid the past one month. 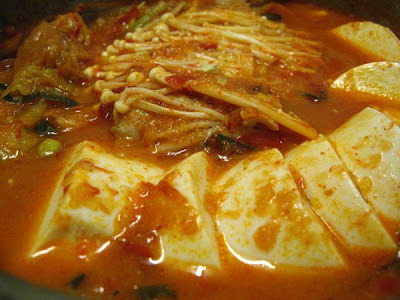 A good time to cook Kimchi Jjigae for dinner ,for the weather was cooling last night after the heavy rain. My first try in cooking Kimchi Jjigae and it turned out good…it was pungent hot enough and the kimchi which was well fermented by now gave it the oomph and two thumbs up to the whole dish. I used chicken fillets instead of pork and I added in enoki for I love the mushroom family :) Piggy and myself finished the whole lot for Daddy is not adventurous at all. made my day after the heavy rain! 2. Add the chicken/pork fillets and sauté until it is just cooked. 3. Add the garlic and ginger and sauté until fragrant. 4. Add the dashi, onion, enoki mushrooms, kimchi , tofu and soy sauce and brings to a boil. 5. Spoon some of the liquid and mix in the gochujang. simmer until the onions are tender. 7. Pour into serving bowl and garnish with the sliced scallions. oh wow! that dish looks like it came from a restaurant! 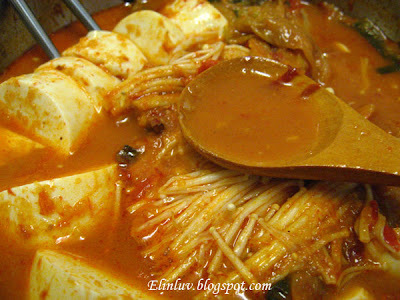 That kimchi jjigae looks really tasty! I've never had enoki mushrooms. I love how they look in this dish. 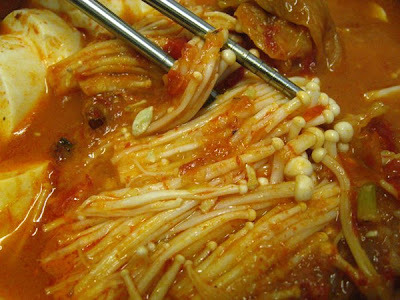 @ Tangled Noodle : :) Do cook this, use a more fermented kimchi and the taste is fantastic. @ Kevin : Hi Kevin, thanks for dropping a line. 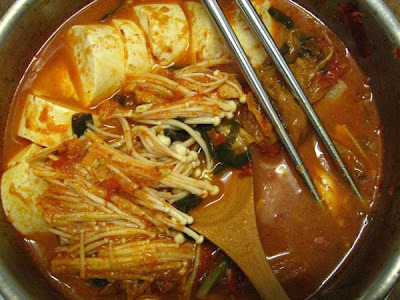 I was inspired by your Kimchi Jjigae which you posted on your blog and I tweaked it a bit by adding enoki and tofu :)) thanks for sharing such a wonderful recipe. @ Dragon : Hi Helen, thanks for dropping by. 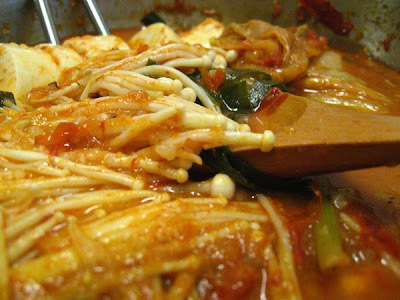 The enoki mushrooms has a chewy texture and it is a good addition for the Kimchi Jjigae. You will love it! I finally plucked up enough courage to make my own kimchi last weekend. And last nite I made Kimchi Stew using this recipe of yours. I made mine without any meat and use can button mushroom instead of enoki cos that's what I have in my pantry. It was a blast. Perfect for the chilly autumn nite. I think I shall live on this stew for the coming cold months ahead. Thanks a bunch.